Portland, Maine. Banker and secretary/treasurer of Dardanelles Mining Co., and later the reorganized Dardanelles Amalgamated Mines, Inc.
New York. President of Dardanelles Mining Co., and later the reorganized Dardanelles Amalgamated Mines, Inc. Accountant and paymaster of Dardanelles Amalgamated Mines, Inc.
New York attorneys for Dardanelles, 55 Wall Street (later 63 Wall Street). They were also attorneys who drew up the change of address, etc. for AGM&M Co.
Kingman, AZ. An attorney for the Dardanelles mining operation along with Conklin & Montrose in NY. Engineer and foreman of Dardanelles mining operation. Took over for Eaton as engineer and foreman. Info listed here has not been verified. Chloride. Engineer and resident manager. JANE MORGAN LUPHER on the California Death Index. Incorporator at time of reorganization of Dardanelles Amalgamated Mines, Inc. Occupation: Miner Value of property: 25 Place of birth: Do. Source Information: Ancestry.com. Arizona and New Mexico Territories Census, late 1800s [database online]. Orem, UT: MyFamily.com, Inc., 1997. Federal Census, Territories of Arizona and New Mexico, late 1800s, Washington: United States Government Printing Office, 1965. 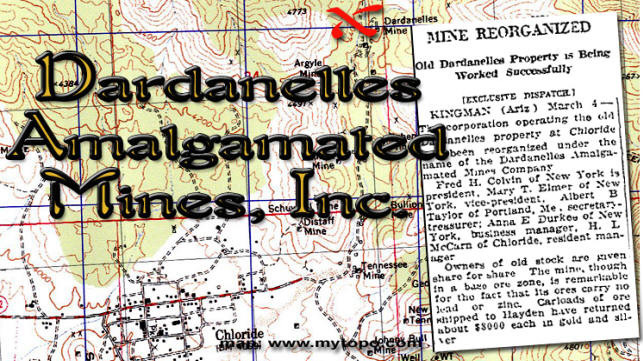 Incorporator at time of reorganization of Dardanelles Amalgamated Mines, Inc. Info listed has not been verified. Hilda may have known the women — or at least known Anna and Mary from their stint in San Francisco. San Francisco. A stockholder who wrote to AZ Geological Survey about status of mine. F: Germany M: Norway ?? M: ? F:LIESKE F Birthplace: ?